SCP-1814 in a deoxygenated environment. Special Containment Procedures: SCP-1814 must be kept in a vacuum-sealed airtight box at all times, except during testing procedures. This box must be deoxygenated. The only entrance to the room is a double-seal airlock. The box's walls must be continually monitored for cracks, chips, or fractures by way of security camera. If any of these are noticed, the room must be immediately evacuated of gas, utilizing a large one-way air turbine in the ceiling above the box, and the box must be repaired by D-class subjects wearing pressurized fireproof suits and respirators. Subjects with respiratory disorders or conditions are not to be allowed into SCP-1814's chamber without a note from a doctor with Class-4 clearance or higher. Subjects exposed to SCP-1814-2 in an oxygenated environment must be immediately and forcefully deoxygenated, even if it results in the subject's death. As a precaution, all subjects entering SCP-1814's chamber must undergo psych evaluation to detect pyromaniac tendencies. Such subjects are to be terminated. Description: SCP-1814 comprises two pieces, usually in contact with each other. These are denoted SCP-1814-1 and SCP-1814-2. 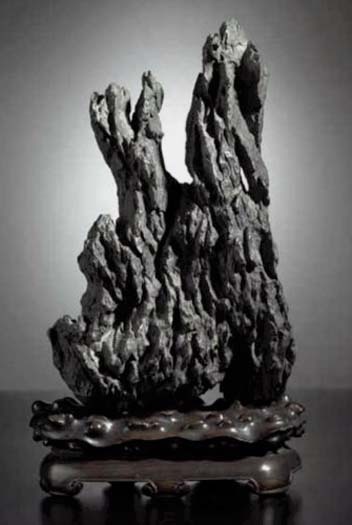 SCP-1814-1 is a pedestal made of petrified spruce wood, triangular in shape and around 7cm tall by 18.5cm to a side. It has six legs, one on each corner and one in the middle of each side. It is carved in an ornate style similar to the art of the ████ Dynasty in China. Despite this, radiometric dating has found it to be at least █████ years older than such a style would suggest. SCP-1814-1 appears to be unaffected by the nature of SCP-1814-2. It is slightly warm to the touch at all times. SCP-1814-2, when in the absence of oxygen, is a complex and random arrangement of pumice stones that resembles a burning flame. When in the presence of oxygen, SCP-1814-2 begins to move and shift, cracking loudly, shattering and reforming, until it achieves a state of intense molecular motion exactly like that of an actual fire. SCP-1814-2 in this state is hot to the touch but its heat is not detectable through visual or infrared light. At this point, SCP-1814-2 will spread in the same manner as that of a regular fire. As it burns, SCP-1814-2 emits sounds similar to an avalanche or grindstone. The sound becomes deeper as larger amounts of SCP-1814-2 are produced. Objects, including life forms, exposed to SCP-1814-2 will quickly catch “on rock,” becoming covered with and consumed by it. Subjects will suffer severe burns equivalent to those from exposure to a flame with a temperature of ███°C. Additionally, SCP-1814-2's excess dust may induce asthma attacks in subjects with respiratory conditions, and otherwise causing instances of SCP-1814-2 to burn inside the subjects' lungs and eventually [DATA EXPUNGED] Throughout this process, SCP-1814-2 retains the same mass as an equal volume of pumice, gradually getting heavier. SCP-1814-2 also acts according to the properties of regular pumice stone. At the speed it shifts, SCP-1814-2 scratches subjects' skin raw, then through their muscle tissue, and finally their bone. However, nearly no blood is lost as the intense heat cauterizes the wounds. Subjects eventually die from a combination of extreme pain, blunt force trauma, asphyxiation, and exfoliation. When all oxygen is removed or used up, all instances of SCP-1814-2 not attached to SCP-1814-1 will die down into “embers” and then turn to pumice dust. Said pumice dust is not hazardous and will not become SCP-1814-2 again. The instance that is attached to SCP-1814-1 will revert to its original state and shape. At this point, SCP-1814-1 and SCP-1814-2 become impossible to separate without damaging either. Subsequent oxygenation and deoxygenation will reform damage to SCP-1814-2, but SCP-1814-1 cannot be repaired this way. SCP-1814 cannot be stored underwater; due to SCP-1814-2 being made of pumice, it would float to the top and catch the containment box on rock. It cannot be stored in a non-reactive noble gas either; early attempts at this yielded a suspicious neon-like glow from SCP-1814-1. Addendum: SCP-1814 was recovered on █/██/20██ when an archaeological expedition to an unknown portion of ███████ Cave in A████ K███, Russia yielded fossilized humanoid remains. The skeletons of approximately 3 individuals of a previously unknown hominid subspecies were [DATA EXPUNGED], but with only minuscule amounts of pumice dust in the wounds. This struck the archaeologists as odd, as pumice does not occur in that region. Their paper on the discovery was intercepted by SCP informational agents before it was published in a scientific journal. The archaeologists were detained and screened, then given class-A amnestics. The cave was closed off under the pretense of "lethal radiation." Agents stated that SCP-1814 itself had used up all the oxygen in the cave thousands of years ago, causing it to put itself out. When the cave was opened, it started to burn again and quickly began to spread. SCP-1814-2 was deoxygenated using a standard issue fire extinguisher, and it was brought back to Site 19 in a makeshift vacuum tank.